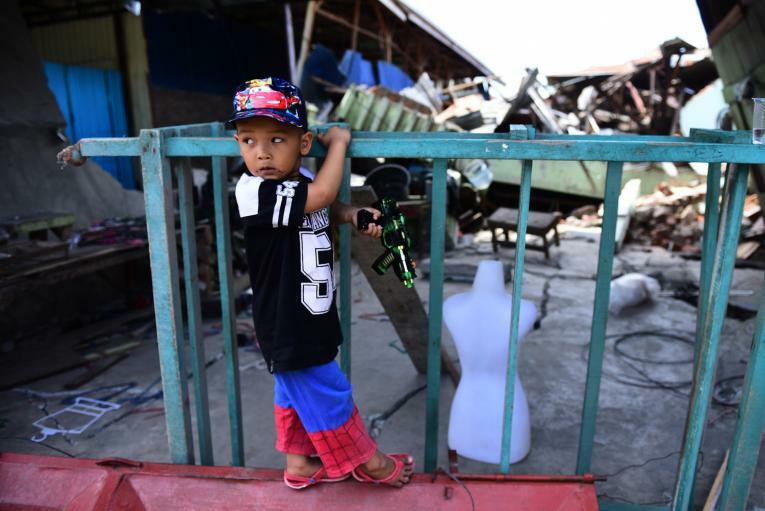 © UNICEF/ UN0241241/ Wilander In Indonesia, Muhamad Akbar, 4 years old, plays in front of the ruins of the building damaged during the earthquake in Palu, South Sulawesi. There are no official figures, but initial reports indicate a high number of separated children. Twelve posts have been set up in the affected areas to identify children who may have been separated from their families or are unaccompanied. These locations are also being used as safe spaces for children to play and recover. Messages on the identification and referral of unaccompanied and separated children have been circulated via digital channels, and signposting at displacement sites is underway. UNICEF is helping the Indonesian Ministry of Social Affairs to implement the Primero database, the only system available in the country that supports tracing and family reunification. UNICEF has been developing this in coordination with the Indonesian authorities prior to the earthquake. When an emergency strikes, children require special protection to ensure their safety and wellbeing. UNICEF and the Indonesian Ministry of Social Affairs are preparing social workers to care for and protect children in case of violence, abuse or exploitation. UNICEF and its partners will also provide psychosocial support to children who have been affected by the disaster.